But pie bars? That’s a whole other story. They just scream fall comfort food. It’s a fast, very easy, one-bowl, no-mixer recipe, but the bars taste like you slaved over them. Love that. The crust is made with brown sugar, flour, and butter and it’s tender, just sweet enough, and the perfect foundation for the filling. The filling is made with brown sugar, maple syrup, vanilla, and an egg, before stirring in pecans and baking. You can use either light or dark brown sugar. Dark brown has more molasses in it, and I find it’s richer and more caramely tasting after baking. Use your favorite. Before serving, I couldn’t resist drizzling salted caramel sauce over the top. Make your own, use Trader Joe’s, or a similar thick sauce. There’s so many textures and layers of flavor in every bite. The soft shortbread crust, contrasted with the sweet, maple-ey, pecan filling, and everything tastes better after it’s been drizzled with salted caramel. So much faster and easier than making pecan pie. The bars are full of rich, smooth maple flavor and scream fall comfort food. There’s so many textures and layers of flavor in every bite. 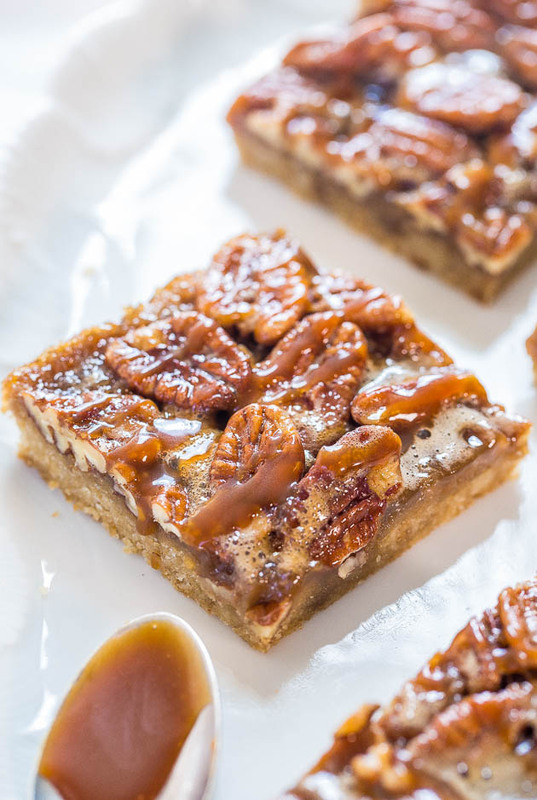 The soft shortbread crust, contrasted with the sweet, maple-ey, pecan filling, and everything tastes better after it’s been drizzled with salted caramel. It’s a fast, very easy, one-bowl, no-mixer recipe, but the bars taste like you slaved over them. So much faster and easier than making pecan pie. Preheat oven to 35oF. Line an 8-by-8-inch baking pan with aluminum foil, spray with cooking spray; set aside. Don’t skip lining the pan with foil because bars are sticky and lining the pan will save lots of cleanup time and elbow grease. Crust – To a large bowl, add the flour, brown sugar, and cut in the butter using two forks or a pastry cutter. Keep working until butter is evenly distributed and pea-sized lumps and sandy bits form. The softer the butter is, the quicker and easier it is. Turn mixture out into prepared pan and hardpack it with a spatula or hands to form a smooth, even crust. Bake for 17 to 18 minutes, or until crust is just set. Don’t overbake because pan is going back into the oven after filling is added. While crust bakes, prepare the filling. Filling – To a large bowl (same one used for crust is fine; just wipe it with a paper towel), add the egg, brown sugar, maple syrup, vanilla, optional salt, and whisk until combined. Stir in the pecans; set aside until crust is done baking. After crust has baked, gently and carefully pour filling over crust (give filling one last quick stir before pouring it), smoothing the pecans with a spatula or use your fingers to evenly distribute them. Make sure they’re not clustered in one area and they’re as flat as possible because edges or corners that are jutting up will be prone to burning. Bake for about 16 to 19 minutes, or until center is set and not jiggly. Use an oven mitt to shake the pan gently starting at about 16 minutes, and use your judgment from there; bars will set up more as they cool. 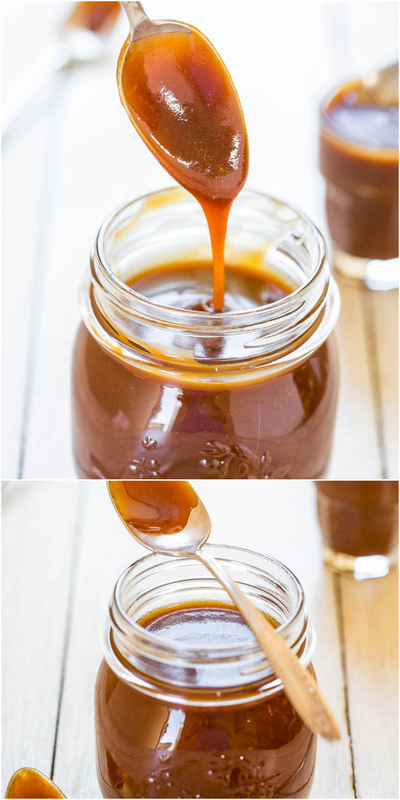 Place pan on a wire rack to cool for at least 1 hour before drizzling with salted caramel, slicing, and serving. Bars will keep airtight at room temperature for up to 5 days, or in the freezer for up to 6 months. The Best Turtle Brownies – Super fudgy and loaded with chocolate, pecans and caramel! So.crazy.good!!! Caramel Apple Crumble Pie – Apple pie meets apple crumble with loads of caramel! The easiest apple pie you’ll ever make. Goofproof 5-minute recipe for those of us who aren’t pie makers! Buttery Pecan Pumpkin Spice Cookies – Buttery soft dough with big chunky pecans in every bite! Salty-and-sweet and so hard to resist!! 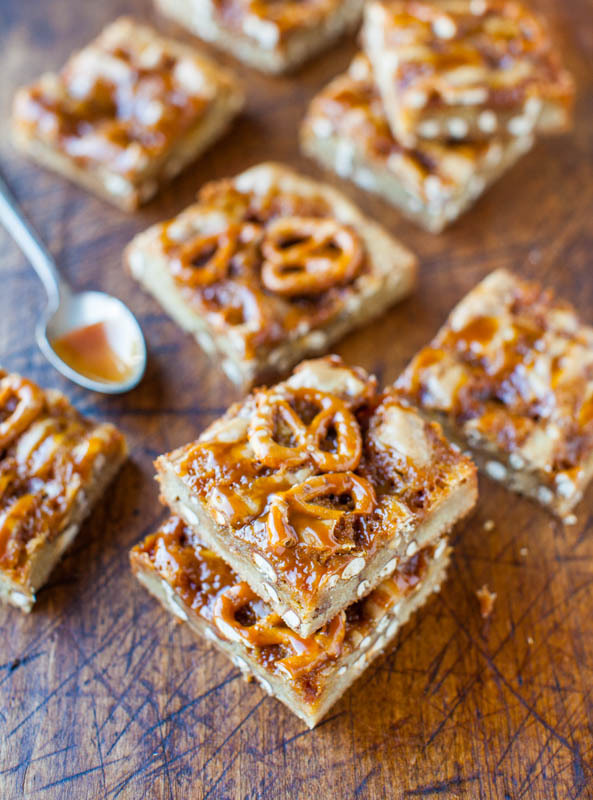 These bars look heavenly, and love the maple syrup addition! I would take these or your chocolate ones any time! I’m also not a big pie person because I don’t really like the crust that much. Everyone always things I’m kind of crazy when I say that. Glad there is somebody else in this world who feels the same way! These bars look amazing. So ooey and gooey. Love them! 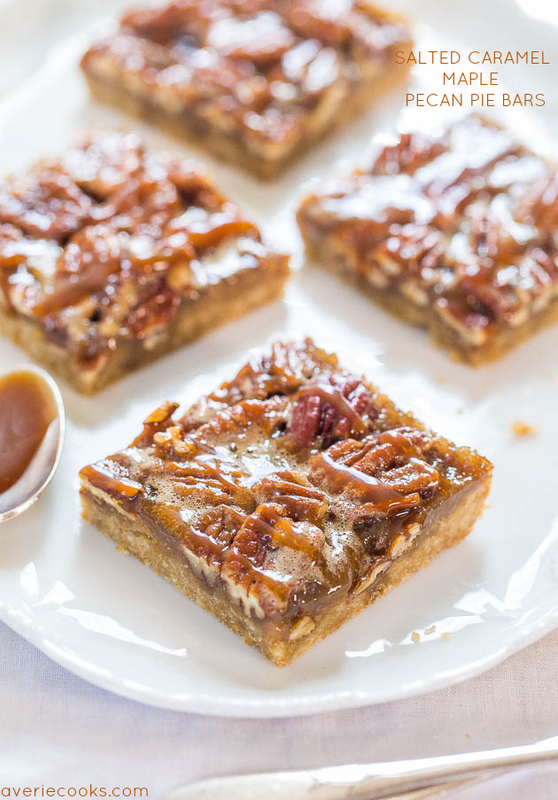 Oh these have my name written all over it, love maple and pecan pie so I know these would totally be delish! These look awesome Averie! I especially love the addition of salted caramel. Did you make a batch with maple syrup to test the taste? Just curious because you describe a delicious maple taste frequently throughout your recipe description, but in the actual recipe say you used sugar-free pancake syrup. Yes I’ve made them both ways and in an effort to save tons of calories, I am fine with the sugar-free route but do which way you prefer. These look so delicious!! I can’t wait to try them at home! Thanks for sharing! Do you think it’d work to double the recipe and use a 9×13 pan in order to feed a crowd? Even though I haven’t personally tried it, I think that would be fine. Did that work for you? I’d like to do that too and am wondering how the results were? I followed the recipe as written and these turned out a soggy mess. The dough was so saturated with the runny Carmel sauce that it fell apart. Good thing I only made half. On the second half I place the dough pecans and chocolate on a cookie sheet and baked until the the pastry started to brown. Meanwhile I cooked the Carmel sauce on the stove at low heat for a few minutes. When the baking was done I drizzled the Carmel on top. This produced a sturdier and prettier product. Glad that you found something that worked well for you. Those look great… in fact, I drool over all the recipes you post!! I’m going to make them and throw in some fresh cranberries!! Thanks for the inspiration! These are delicious. I am not a big fan of pie as well. I made them without gluten and dairy but substituting vegan margarine and a gluten free flour mix for the crust. 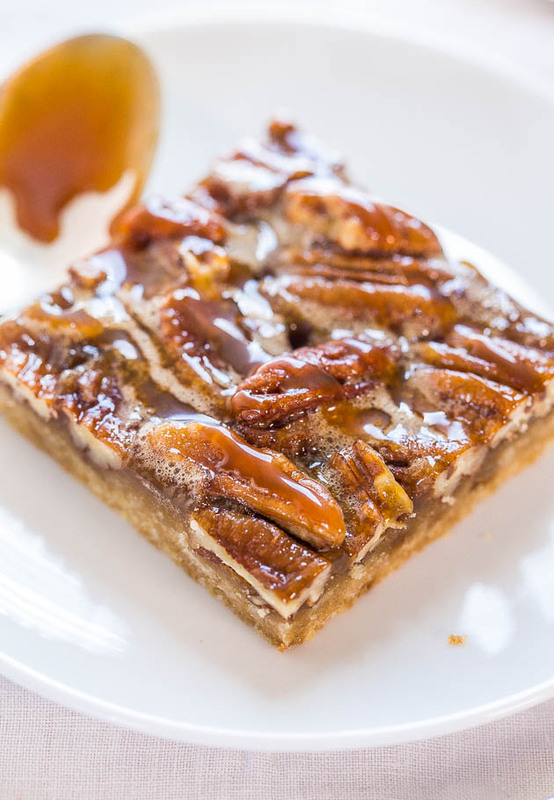 These are especially great because they don’t have that eggy taste that some other pecan pie bars do. Glad these came out great for you and were able to make them both gluten AND dairy-free! That’s wonderful! These are absolutely delicious!!! I also made them dairy and gluten free by using Pillsbury’s gluten-free flour mix and earth balance for the butter. I decided to skip the caramel sauce on top altogether, and even without that they were perfect! My sister isn’t even gluten-free, and she can’t stop eating these. :) Thanks so much! Thanks for trying the recipe and I’m glad it came out great for, and both GF and DF, even better! Glad that they’re a hit even with your non-GF sister! I normally find pecan pie too be too sweet and actually kind of gross. The “picture” is usually too sweet with a weird consistency. I just find it appalling. 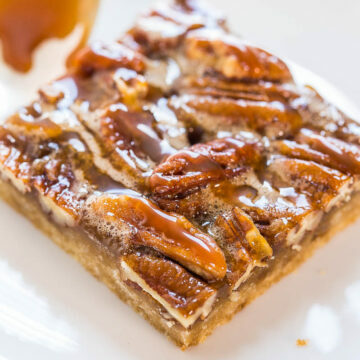 The maple pecan bars however are amazing. I made some for a party and none were left. Luckily I doubled the recipe and used a larger pan. I stashed about 6 bars away for myself and neighbor to try. I must say they are simply fabulous and remind me of !exican candy. Anyway, fantastic recipe I will use this again. Thanks for trying the recipe and I’m glad it came out great for you! And that a double batch disappeared very quickly, great to hear! I have a feeling these will be a go to recipe in our house! They’re in the oven and my kitchen smells amazing! We live in maple country, so the deeper, darker, extra maple-y flavor of local grade B syrup takes this super easy recipe a winner. Now I’m just wishing this double batch wasn’t getting delivered to church later… Thank you! Thanks for trying the recipe and I’m glad it came out great for you! And so nice of you to make a double batch and share it with your church! I doubled the recipe which turned out perfect. After reading your recipe for homemade salted carmel sauce I decided to try making it. You made it sound so easy & actually it was! These bars are really good on their own but if you top them with the sauce, it takes them to a whole new level. I shared them with friends & everyone was blown away! I also substituted gluten free flour for the crust & made a batch for my daughter. She loves took them in her lunch, had them for breakfast & dessert! I also used pure maple syrup. I am new to baking & have used several of your recipes. You make it all sound simple. I am so happy I found your site. ThankYou!!! Thanks for trying the recipe and I’m glad it came out great for you! And bravo to you for making homemade caramel, for making them GF, and for making a double batch! Wow I am so impressed! And you say you’re new to baking? Well if you can make homemade caramel and whip up GF crusts, you’re a total natural! Thanks for finding my site! Averie, this recipe is fabulous. 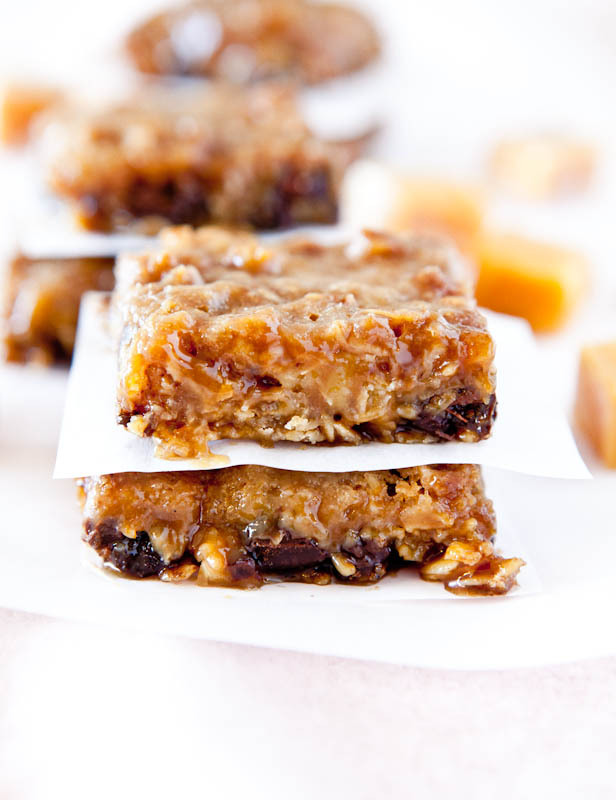 I’ve made these bars on several occasions… Thanksgiving, house parties, office parties … and every time they are a hit. Thanks for sharing. It has become my official go-to treat! Thanks for trying the recipe and glad you keep coming back to it as your go-to treat! Thanks for trying the recipe and I’m glad it came out great for you, even w/out the caramel sauce! Oh My! Made these gluten free and without the extra caramel sauce but wow! Just what I was craving! I hate the goop in pecan pie. Perfect even though I cut the sugars to 1/4 cup. Yummmm! Thanks for trying the recipe and I’m glad it came out great for you even with making it GF and less sugar and caramel! Made these today without the caramel sauce (I’m just lazy) and they’re perfect. So good!